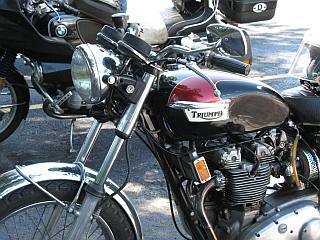 Motorcycle Fuel - the most basic maintenance that you will do is keep your motorcycle tank full of fuel. No brainer, right? The size of your fuel tank is information that you will find in your motorcycle manual. You need to know what the recommended fuel is for your bike - premium or regular, or something in between. It's also a good thing to know if there are any additives that may be recommended for your motorcycle. Then, you need to figure out the basic fuel efficiency of your motorcycle - it's very useful to have a handle on approximately how many miles you can expect to get per gallon of gasoline, and approximately how many miles you can travel on a full tank of gasoline. My BMW motorcycle has a 5.2 gallon tank, and I can travel anywhere from 120 - 160 miles per tank of gasoline, depending on conditions. My usual riding companion rides a BMW touring motorcycle - R 1100 RT, which has a much bigger tank and can travel much farther between gas stops. 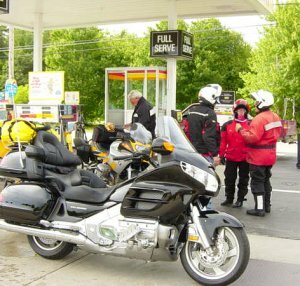 On long trips, the disparity between our bikes, in terms of gas mileage, can be a problem. * Northern California - On a tiny road through the Tall Trees Forest. * That same trip, nearing Eureka, California. * France - near Burgundy, on a Sunday evening after most gas stations were closed. I'm sure there are more, but I may have blocked them. But, I have learned from these experiences. Now, if I am nearing the 100 mile mark on a tank of gas, and we are riding in a rural area, I'll pull into the next gas station and fill up - no matter what. And, my most recent purchase: A hand pump powered gasoline siphon. Motorcycles are much better with fuel efficiency than 4-wheeled vehicles, yet there are still things you can do and not do that will improve your use of motorcycle fuel. * Use the clutch smoothly, and only when necessary. * Anticipate stops to prevent sudden braking. * Avoid unnecessary idling and if stopped for a train, turn the bike off. * Have your bike serviced as the manufacturer recommends. * Black smoke from the exhaust is not good - get to a mechanic. * If you suspect a fuel leak, also get some service. * Keep your tires inflated - under inflated tires impact fuel consumption negatively. * Your spark plugs should be clean and free of deposits, cracks, wear and erosion. * Make sure your battery is charged for smooth starts. Also keep in mind that the type of roads on which you are traveling make a difference in motorcycle fuel consumption. If you spend a few hours riding through hairpin turns, you're going to use more fuel. If you are riding on highways at a relatively steady speed, your fuel will be used more efficiently. Stop and go traffic is another sure fuel-sucker. Just like traffic, weather conditions have an effect on fuel use - riding in rain, and in extreme conditions will result in less miles per gallon. Be prepared, and just make sure that if you do run out of gas - you do it in a scenic, and safe place.